How should I make this curve? It will be 34.5" long, with a 32" radius according to Sketchup. I imagine s ome of you might do it with a band saw and a spindle sander, but that's not an option for me. I have done pattern routing in the past, with success. But I wonder if with this large a curve it might be easier to whip up a jig with a pivot point 34" from the router bit. I would of course roughly cut out the shape with a sabre saw before routing in either case. On Tuesday, April 2, 2019 at 9:36:09 AM UTC-5, Greg Guarino wrote: I would of course roughly cut out the shape with a sabre saw before routing in either case. I suppose you know.... Got a wood vise? Or find a way to clamp your board vertically, to more easily cut with the saber saw. Also, might want to make a few/several radial cuts, before rough cutting the arc. I have a piece of plywood that I attach my router on to and I pivot the router and plywood piece as you are mentioning. Just make the cut in 3~4 passes. When I have a ellipse type arc I print the ark at full scale on Sketchup, tape the pieces together, glue the drawing to the board and cut out with either a band saw or jig saw. Then smooth with a spindle sander. ne some of you might do it with a band saw and a spindle sander, but that's not an option for me. with this large a curve it might be easier to whip up a jig with a pivot po int 34" from the router bit. I would of course roughly cut out the shape wi th a sabre saw before routing in either case. In my case, I will definitely be using a router. I doubt that I could appro ach the accuracy I'll get with a router with any other method that is curre ntly available to me. The question is should I make a template or make myse lf a circle jig. The template I certainly know how to do. I was curious to see if anyone her e used a "jig" - as you mention, just a piece of ply with a couple of holes in it. I may give that a shot. Do I understand you correctly that you do n ot even cut out the curve roughly beforehand? You make the entire cut with the router, getting deeper with each pass? I do have a plunge router, but I had not considered that. If you can make a template then why not just cut the curve the same way you would have cut the template? Personally if I didn't have the tools I have, I'd make a spline, use it to draw the curve, rough it out with a jigsaw (or coping saw if I didn't have a jigsaw), and smooth it down with a sanding spline. This isn't one of those deals where you have to have absolute precision, as long as it's a smooth curve nobody's going to notice if it isn't a perfect arc of a circle. agine some of you might do it with a band saw and a spindle sander, but tha t's not an option for me. if with this large a curve it might be easier to whip up a jig with a pivot point 34" from the router bit. I would of course roughly cut out the shape with a sabre saw before routing in either case. proach the accuracy I'll get with a router with any other method that is cu rrently available to me. The question is should I make a template or make m yself a circle jig. here used a "jig" - as you mention, just a piece of ply with a couple of ho les in it. I may give that a shot. Do I understand you correctly that you d o not even cut out the curve roughly beforehand? You make the entire cut wi th the router, getting deeper with each pass? I do have a plunge router, bu t I had not considered that. You have a point, I guess. When I have done this before I was making multip le identical pieces. I still think I could "fair" a 1/4" MDF template to th e curve more easily than 3/4" oak though. Yes, and when you slip and screw it up, you won't cry as much over ruined MDF. You can probably repair it well enough to continue using it as a template, too. Make a circle jig if your arc has a continuously same radius, IOW not an ellipse. Sorry if I was unclear on that. Yex, I do not cut close to the line, I let the router take a full width cut and go deeper with each pass. What size bit do you typically use? And another ignorant question: As the bit will have wood on both sides, which direction do you move the router? I'm going to guess that it doesn't matter, but that I should keep it consistent. IIRC I used a 1/2" bit. I went counter clockwise for a lazy Susan piece that I did a couple of years ago. In your case I would go clockwise. You typically want the bit to be cutting away from the piece you want to keep. Shouldn't that be leading cutter rotating into the piece you want to keep ? .. experiment on a scrap piece to be sure .. John T.
OK, so with the router bit facing down the bit spins clockwise. When cutting a circle and you want to keep the circle, you want to keep the convex part of the cut, the router should go counter clockwise. When keeping the concave side of the cut the router should be going clockwise. Going in the direction described above the bit will resist feed. If you go in the opposite direction for both operations above the bit will try to climb into the cut. Basically you want the bit to be cutting/pulling away from the keeper side. 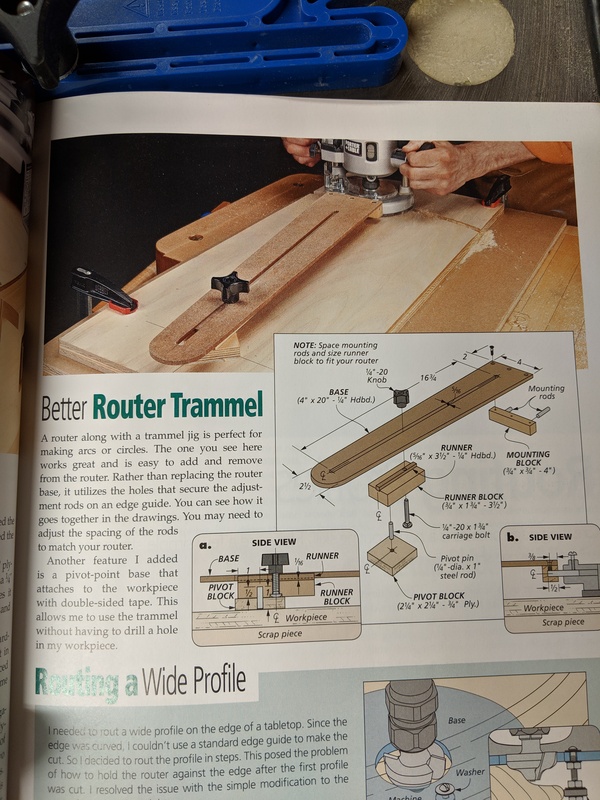 With the palm down of your right hand facing down and the thumb and index finger held at 90°, your thumb points at the edge that you want to rout (or in this case, keep) and your index finger points in the direction that you should move the router. To keep the circle, your thumb would point towards the center of the circle therefore your index finger would point to the right, which would be counter-clockwise. some of you might do it with a band saw and a spindle sander, but that's n ot an option for me. th this large a curve it might be easier to whip up a jig with a pivot poin t 34" from the router bit. I would of course roughly cut out the shape with a sabre saw before routing in either case. Are you cutting an opening or a table top? How this is approached will be very different, depending on the form. The best thing is the old two nail and a string trick to make the pattern, once you have that refined then tr ansfer, saw and pattern rout. All that assuming you are working on a table top. e very different, depending on the form. The best thing is the old two nai l and a string trick to make the pattern, once you have that refined then transfer, saw and pattern rout. All that assuming you are working on a tab le top. In solid wood, it's easy to kerf near the curve, then... just carve the thing with a wide chisel. A drawknife is good, too, but chisel is fast, and a spokeshave can finish it just fine. I'd want to consider non-circular curves, too; freeform is a side benefit of leaving motorized tools shelved. hing with a wide chisel. Wow. I'm afraid that my efforts with chisels would yield a very freeform re sult indeed. I did however consider non-circular curves (and for that matte r, non-curves. Any shape with no concave parts that are smaller than the di ameter of my router bit are possible using a template, especially one print ed directly from the drawing, as Leon suggested. But I like the simplicity of a true arc. How about a long trammel? Lee Valley's AFD "Pause" now Permanent? Router sled for cutting curve/dip? Do they make a rubbery paint for chipped refrigerator wire racks? what could I do to make the toe kick more interesting? Cutting longish curve in plywood. Makeing Plywood curve using kerf cuts. How to make a curved cabinet door? How to make quarter rounds and to make a diagonal cut with common tools?